Joseph Chase is a business and corporate attorney with Gunster law firm. He focuses his practice on helping clients navigate private company mergers and acquisitions and other complex business transactions. He has represented private companies, private equity firms and venture capital firms in connection with mergers and acquisitions, divestitures, recapitalizations, debt and equity restructurings, executive compensation and incentive equity matters, as well as general corporate matters. Prior to joining Gunster in 2010, Chase did similar work as an attorney with Kirkland & Ellis LLP in Chicago, Illinois. A resident of the historic El Cid neighborhood in West Palm Beach, Chase is an energetic, high-profile member of the community with a passion for service. 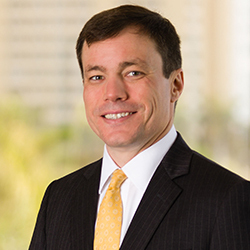 He served as the 2016-17 Chair of the Chamber of Commerce of the Palm Beaches and has been involved for several years in the chamber’s Executive and Governmental Affairs committees. He currently serves as the Secretary/Treasurer of the Forum Club of the Palm Beaches. He also serves on the executive committee of the Historical Society of Palm Beach County and the board of directors of the YMCA of the Palm Beaches.